Local police confirm twelve people were killed, and 48 injured when a truck plowed into a crowded Christmas market in east Berlin around 8:00pm on Monday evening. According to information from German newspaper Die Welt, the alleged truck driver is from Pakistan, and is reported to have arrived as a refugee in Germany on 16 February 2016. The dead passenger was a Polish national. German police is urging Berliners to stay at home; Merkel is to be briefed by the German Interior Minister. 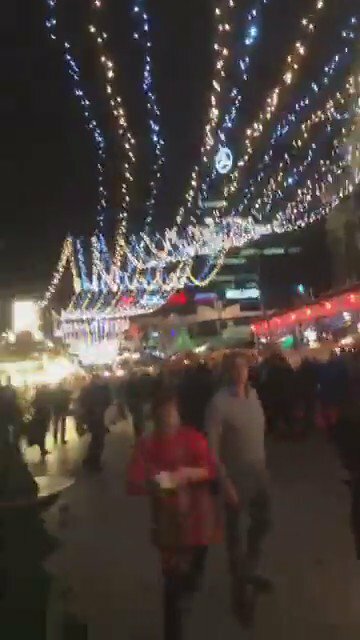 The drama on the Berlin Christmas market is a “terrible terror attack”. “Innocent civilians were murdered on the street when they were just about to celebrate the Christmas holidays,” Trump wrote in a message. “The Islamic state and other Islamic terrorists regularly slaughter Christians in their communities,” Trump continues. A truck plowed into a crowd at a busy Christmas market in western Berlin leaving at least nine dead according to Berlin police, and over 50 people injured. The driver of the truck has been arrested and his co-driver is said to have died during the crash. Local media, citing police at the scene, said first indications pointed to an attack on the market, situated in front of the Kaiser Wilhelm Memorial Church, a popular site for tourists. A police spokesperson told German media that they are treating the truck incident in Berlin as a terrorist attack. The vehicle “drove sideways” onto the pavement at Breitscheidplatz, a major public square, reported Polizei Berlin. Police cars and ambulances converged quickly on the scene as a huge security operation unfolded. A spokeswoman for the Berlin police said that around 8:00 p.m. local time a semitrailer truck drove onto the sidewalk drove onto the sidewalk near Breitscheidplatz. After hitting the people, the truck then swerved back into the street where it came to a stop, she said. Two people were in the truck as it smashed into the Christmas market, a police spokesperson told Berlin Morgenpost. German newspaper Die Welt is reporting that the driver of the truck, who is currently in custody, was from Pakistan and entered Germany on February 16, 2016. The passenger, a polish national, was detained at the scene but later died, the official said. A truck rammed into a crowded Christmas market in Berlin Monday night, killing at least 12 people and injured 48 others in what witnesses described as a deliberate attack. Meanwhile German police has called on Berliners to “stay at home” after the deadly truck attack. Television pictures from Berlin showed the truck standing amid debris by small wooden stalls that make up the “Christkindlmarkt” of which there are several in Berlin at this time of year. Police cars and ambulances converged on the scene. Reuters reports that the German Interior minister to brief German Chancellor Angela Merkel and Berlin’s mayor about the Christmas market incident, according to Reuters. Later in the day, US National Security Council spokesperson Ned Price condemned “what appears to have been a terrorist attack” on the Berlin Christmas market. We were enjoying the Christmas lights when we heard a loud bang. We were sitting down, ready to get up. We saw to our left Christmas lights torn down and we saw the top of an articulated lorry crashing through the stalls and through people. The lorry was driving fast, and it showed few signs that it was slowing down. We wanted to get out as soon as possible, we wanted to get to a safe place. She said she considered stopping to help the wounded, but decided it was too dangerous to remain in the area, and instead returned to her hotel. From my opinion, it was going at 40mph, there was no road nearby and no signs it was slowing down. It did not feel like an accident…there was no way it could have come off like an accident, it was through the middle of the market. If it did not feel like an accident it is perhaps because it is now being considered as the latest act of terrorism. U.S. citizens should exercise caution at holiday festivals, events, and outdoor markets. This Travel Alert expires on February 20, 2017. Credible information indicates the Islamic State of Iraq and the Levant (ISIL or Da’esh), al-Qa’ida, and their affiliates continue to plan terrorist attacks in Europe, with a focus on the upcoming holiday season and associated events. U.S. citizens should also be alert to the possibility that extremist sympathizers or self-radicalized extremists may conduct attacks during this period with little or no warning. Terrorists may employ a wide variety of tactics, using both conventional and non-conventional weapons and targeting both official and private interests. We are confident Merkel will be asked why she didn’t give out a similar warning to her own citizens. The Police have said that the first indications from the ongoing investigation suggest the truck crash was an attack on the Christmas market. BREAKING: Reports: Truck runs into crowded Christmas market in Berlin; multiple injuries reported. Police said that “numerous” people had been injured, but there is presently no information on potential fatalities. Truck drives into a crowded Christmas Market in #Germany‘s #Berlin. Many people injured. Many unconscious on the ground. Reports of a shot.